It would be hard to come up with a more intelligent and lively mixed breed dog than the Bordoodle—the Border Collie Poodle mix. But is a Bordoodle, also known as a Border Doodle, the right dog for you? 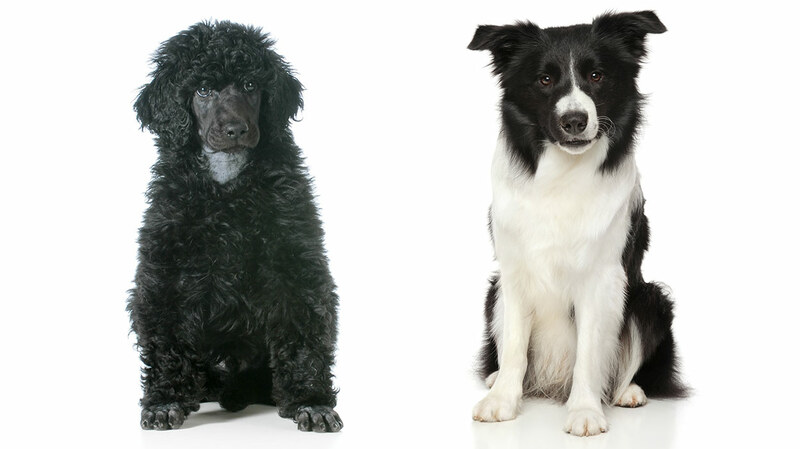 In this article, we’ll look at the Border Collie, Poodle, and Border Collie Poodle mix. So you can make an informed decision about whether or not to add one of these appealing pups to your family. So, what should potential owners know about the Bordoodle? Well, before we look at each parent breed, it’s important to understand exactly what a designer mixed breed dog is. What’s the difference between a purebred dog, a mutt, and a mixed breed dog? Here’s a quick run-down but you can read an in-depth comparison in this article. A purebred is the offspring of two dogs of the same breed that have a pedigree (known ancestry). So-called pedigree dogs are usually registered with an official breed organization like the American Kennel Club (AKC). A mutt, on the other hand, is the product of two dogs of unknown ancestry mating. One or both parents could be a mutt or a recognizable breed. A designer dog, however, is the result of a planned mating between two purebred dogs of different breeds. Designer dogs have become increasingly popular over the past few decades and the Poodle is commonly used in hybrids. Are mixed breed dogs inherently healthier than purebred dogs? You may have heard of the term hybrid vigor. The idea of hybrid vigor—that mutts and mixed breeds are more robust than purebreds—can be true if inbreeding is prevalent in a purebred genetic line. Therefore, it’s also important to verify that your Bordoodle comes from a healthy Border Collie and Poodle breeding stock since most purebred dogs have some inherited health problems. Responsible breeders can minimize health problems by outcrossing with different lines and performing genetic health tests on their dogs (and only breeding healthy ones). We’ll talk more about verifying the health of your Border Collie Poodle Mix a little later. First, take a look at the parent breeds! The Border Collie is a highly intelligent and energetic working dog. A member of the herding group, the Border Collie was developed in Britain as a livestock herding dog in the rugged border counties between England and Scotland. Border Collies are often referred to as one of the most intelligent dog breeds. They are keen and focused herders with a very strong work ethic! Border Collies are also athletic and require a lot of exercise and activities to keep them happy. The Poodle also has a reputation for being one of the smartest dog breeds. Despite their association with France, Poodles were originally developed in Germany to work with hunters as retrieving water dogs. The curly Poodle coat served a practical purpose in those early days, protecting the dogs from cold water. In fact, the iconic Poodle haircut was first designed to protect certain areas of the body from the cold. Today’s Poodle comes in three sizes: standard, miniature, and toy. Most Borderdoodles are a mix between the Border Collie and larger standard Poodle. But of course, any size Poodle can be used. How big will your full grown Bordoodle be? Let’s first take look at the Border Collie and Standard Poodle to find out. Border Collies are medium-sized dogs with males reaching 19 to 22 inches tall at the shoulders and females reaching 18 to 21 inches. Border Collies weigh around 30 lbs for females to 55 lbs for males. The AKC breed standard suggests Border Collies should have an overall appearance of athleticism, grace, and agility—fitting for their job as a livestock herding dog. A standard Poodle should be 15 inches or taller at the shoulders. Males weigh between 60 and 70 lbs, whereas females weigh between 40 and 50 lbs. You can check out the standard size of miniature and toy Poodles on the AKC website. The breed standard calls for an elegant and proud appearance—Poodles are well-known for a dignified yet jaunty demeanor that fans of the breed find very appealing. So, what about the Border Collie Poodle mix? As with any mixed breed dog, the Bordoodle can have physical characteristics of either parent breed, in any combination. In general, you can expect your full grown Border Collie Poodle mix to be medium-sized, between 15 and 22 inches tall at the shoulders and weighing anywhere from 30 to 60 lbs, depending on gender. These size ranges vary from dog to dog and are based on the standard Poodle as one of the parent breeds. But remember, there are no size guarantees with a crossbreed! You may be wondering, what kind of coat will your dog have? Let’s find out. Many potential owners are interested in Poodle crosses like the Bordoodle because they are concerned about grooming, shedding, and allergy issues. So, let’ consider both parent breeds to find out what your Bordoodle’s coat might be like. Border Collies can have a long or a short coat. Either way, they will have a soft dense undercoat that sheds seasonally. Rough-coated dogs may have longer fur with feathering on the legs, chest, and underside, Whereas smooth-coated Collies have shorter hair with only a small amount of feathering. Border Collies with either coat length require once or twice weekly brushing with a slicker brush. Daily brushing may be needed during shedding season. Most people think of black and white fur when they think of a Border Collie, but they can come in any coat color with any type of markings. Like other working breeds, color is less important than performance. A Poodle’s coat is curly and dense and is relatively high maintenance when not clipped short. A Poodle wearing its full coat will require regular professional grooming, which is why many owners keep their coats trimmed. Poodles do not have an undercoat like the Border Collie, which means they don’t shed seasonally, and they are generally regarded as a low shedding breed. The Poodle can come in a wide range of coat colors, from white to black and many shades in between. With purebred Poodles, their color is solid and even with no markings. What Will Your Bordoodle Look Like? 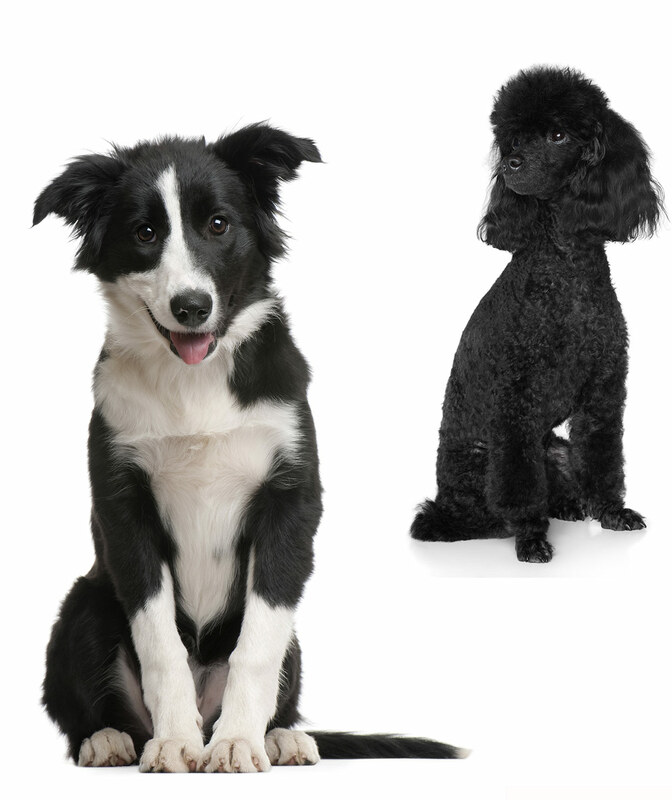 Similar to size, the Border Collie Poodle mix can have coat characteristics of either parent breed in any combination. This is important to note if you are allergic to dogs. Although Poodles have a reputation for being hypoallergenic, there are no guarantees with a Border Collie Poodle mix. If you have allergies, be sure to spend some time with a Bordoodle before getting one. Expect your Borderdoodle’s coat to be medium length with a curly or wavy in texture. Shedding and grooming requirements can vary, given the different coat types of the parent breeds. Don’t assume your Bordoodle will be low shedding, although it is a possibility. Border Collie Poodle mix coats can come in any combination of colors and patterns. Many people like the classic black and white Border Collie markings, but various colors and patterns are possible. Finally, a Border Collie Poodle mix will usually have brown eyes. While the Poodle has been a favorite companion animal for many years, the Border Collie was primarily bred as a working dog. Poodles are active, proud, and intelligent, whereas Border Collies are extremely high energy and their intensity level may be more than an inexperienced owner can handle. Border Collies are not couch potatoes, so if you don’t have sheep to herd, engaging your dog in activities like agility trials is a must. Again, it’s important to remember that your Bordoodle’s temperament can favor one parent breed over the other or be a combination of both. Either way, expect your dog to be intelligent given the high intelligence of both parent breeds. In general, they are also loving, playful, and energetic so a Bordoodle usually does well in active families with children. And because they are so smart, they are also highly trainable. The working dog genes of the Border Collie may require your Border Collie Poodle mix to be properly socialized and obedience trained from an early age. Remember, a strong herding instinct is common in Border Collies, which is important if you have very young children or small pets like cats. Does the Border Collie Poodle mix have any health problems? As we mentioned earlier, most purebred dogs have some inherited health conditions and the Border Collie and Poodle are no exception. Here is an overview of the most significant health issues of Border Collies and Poodles that potential Borderdoodle owners should know about. Because the Border Collie has long been bred for its working ability rather than appearance, it is a relatively healthy breed. However, there are still a few potential health risks to bear in mind. The American Border Collie Association (ABCA) lists the genetic health conditions that may occur in Border Collies. These health conditions are common in many purebred dog breeds. Of special concern for Border Collie breeders and owners is a condition called Collie eye anomaly (CEA), an inherited eye disease that affects different types of Collies and Sheepdogs. With CEA, blood vessels that lead to the retina are underdeveloped, which can lead to blindness. Fortunately, there’s a genetic test for this disease and responsible breeders will prevent carriers from passing on the gene to future generations. The standard Poodle has several serious genetic health conditions that potential Bordoodle owners should know about. The complete list is quite long, but here are a few of the most significant problems. Lack of diversity in the gene pool has led to several autoimmune conditions in the Poodle. Addison’s disease and sebaceous adenitis are two of the more common. Addison’s disease occurs when the dog’s immune system attacks the adrenal glands and causes a steroidal hormone deficiency. Sebaceous adenitis (SA) is an inflammatory skin disease caused by the immune system’s attack on the skin’s sebaceous (oil) glands. Epilepsy is a neurological condition that causes seizures. Standard Poodles are among a group of dog breeds that are prone to inherited epilepsy. Veterinarians use a variety of drugs to prevent seizures, but many have serious side effects. Genetic tests are also available for several Poodle health problems. So what about the Bordoodle? Your dog could inherit genetic health problems from either parent breed. Chronic health issues like epilepsy, hip dysplasia, skin problems, and eye disease can occur in Bordoodles. How can you make sure your Bordoodle puppy is as healthy as possible? Here are a few tips on picking a healthy puppy. Because both the Border Collie and (especially) the standard Poodle can have a number of inherited health conditions, it’s important to consider only reputable Bordoodle breeders. Look for local, small-scale breeders who welcomes potential clients into their home and kennel facilities. You should be allowed see the living conditions of your puppy, meet the parents and littermates, and most importantly, see all genetic health test results. Because hybrids are so popular, when you buy a Bordoodle from a retail pet shop or from an ad on the internet, there are some risks. There is a chance that your puppy may come from a large, for-profit breeding operation called a puppy mill—puppy mills do not generally invest in genetic health testing like responsible breeders do. So, what kind of health tests should you look for? A good breeder will show you proof of genetic health testing from organizations such as the Orthopedic Foundation for Animals and the Canine Eye Registry Foundation. They may also have test results from private and veterinary school DNA testing laboratories. Their eyes, nose, and rear end should be free from discharge. A healthy coat and blemish-free skin is a must, as well as a temperament that is not shy, fearful, or lethargic. What About a Border Collie Poodle Mix Rescue Dog? A Bordoodle rescue can be a great option, especially if you’re willing to adopt an adult dog. To find a Border Collie Poodle mix rescue dog, check with local breed-specific rescue groups for both the Border Collie and Poodle. Tell them you are interested in a Bordoodle. You can also do a breed-focused search on pet adoption websites like Petfinder. Is a Bordoodle Right for You? The Border Collie Poodle mix is a highly energetic, intelligent dog. 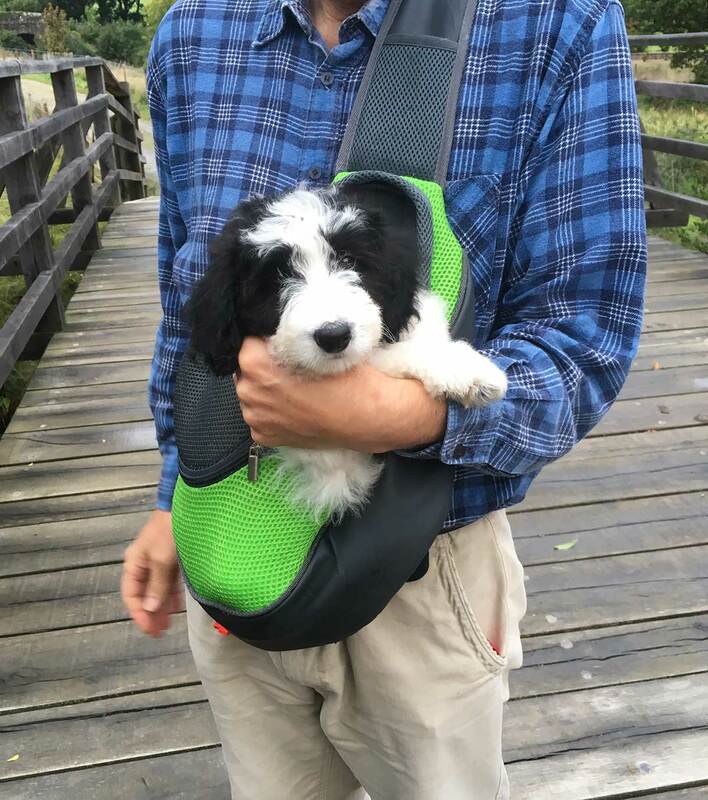 If you love being out and about, walking and playing with your dog, and have plenty of time to spend with your new super smart bestie, a Borderdoodle may be the right choice for you. Whatever breed you decide, good luck in the search for your new best friend! Are you thinking about a Border Collie Poodle Mix puppy? Or maybe you already have a Bordoodle? Let us know in the comments! Palanova A. 2015. Collie Eye Anomaly: A Review. Veterinarni Medicina. Pedersen NC et al. 2015. The Effect of Genetic Bottlenecks and Inbreeding on the Incidence of Two Major Autoimmune Diseases in Standard Poodles, Sebaceous Adenitis and Addison’s Disease. Canine Genetics and Epidemiology. Is there somewhere in the Naples, Florida, area where we might be able to see and, hopefully, purchase a bordoodle? Where are you located? Do you still have any pups? Easy to train and very loving. They just want to please you. I may be interested in a Bordoodle puppy. Where are you located and do you have any puppies available? I am in Los Angeles. We have a one year old golden coloured Bordoodle. She has been a delight from day one: easy to toilet train, can be left at home safely for 7 hours a day, sociable and curious. We just adore her! She sleeps well overnight, loves to snuggle and be with us all. Couldn’t think think of a bad thing to say. I might be interested where are you located. We had a border collie years ago and he was the best dog. I’m a runner and would like another dog. I had rescued a 1 yr old Goldendoodle about 4 months ago, a very good mannered, docile female, that had no training at all. She went into heat about a week after we got her, and long story short- we now have 10 Goldendoodle-Border collie pups! – all very healthy and happy at 4 weeks old! I am, of course, looking to sell them to good parents after getting all their vaccinations, etc. Any suggestions? I am very interested! Where are you located and how can I best contact you? oh, I would love to see pictures and would be interested in the puppies. Where do you live? Do you have pups available still? Hi we are looking for a hypoallergenic dog and we would love to buy one of your puppies! What area do you live in? Thank you! We have had 3 Border Collies, 1 purebred, 1 Border Collie/Shellie mix and one our vet believed was mostly Border Collie with some Cocker. All were terrific family pets with lots of fun and energy; VERY intelligent and easy to train. Would love to get more info about your puppies. Where are you located? Thank you! Are any of these available, if so are there pictures? We are the besotted owners of Polly doodle. Five year old, really bright, loving and obedient bordoodle. Until she was four, she was an absolute ,box of frogs, so enthusiastic and full of bounce, but then she settled so well I decided she would make an excellent therapy dog. She was assessed by the charity and granted admission. Her soft curly coat is just so tickle able and people at the various establishments we are registered with really enjoy her company.Last week in a fun dog show she won a rosette in the ,working dogs group!, she was against various sheep dogs but I reckon she won the sympathy vote. She is the right dog for us, active retirees. Bordoodles are the best! Our bordoodle “Bailey” is very good with our kids and she is so smart! She is cream and white and her fur is on the curlier side. she is non-shedding. she is exctly what we wanted for our family. We got her from Mountain Rose Bordoodles in Utah. We just love her so much!